*Note : Some have had issues with the dough for this recipe. I am deleting the yogurt note as I know for certain that the bread works with the Farmer's Cheese (dry curd cottage cheese). A reader told me they subbed thick greek yogurt and had success, but I have never tried it myself. 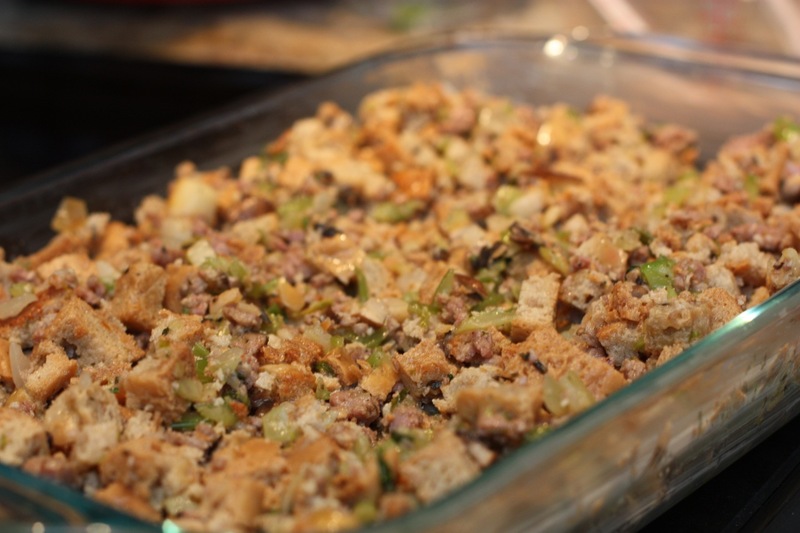 I have also made this stuffing recipe using Elana's Pantry's Paleo Bread, so if you'd like, you can sub that loaf instead. I am trying to make all of my Thanksgiving recipes early so I can have them up for you in time to go grocery shopping before Thursday! Here is my favorite stuffing recipe. I made it a few years back when I first started the Specific Carbohydrate Diet and fooled everyone at the table into thinking it was just a general gluten filled stuffing. Much to their surprise, they found out the bread was grain-free! I tweaked a few things this year and it just passed the taste test with my husband and in-laws, so it's a winner. I'll be serving it to 8 guests this year who generally eat a grain/gluten filled diet. As I've mentioned before, the kind of almond flour you use really makes all the difference in the quality of your bread. Store bought brands like Bob's Redmill WON'T work. It yields an overly moist bread with a really grainy consistency. See my post All About Almond Flour for some tips. 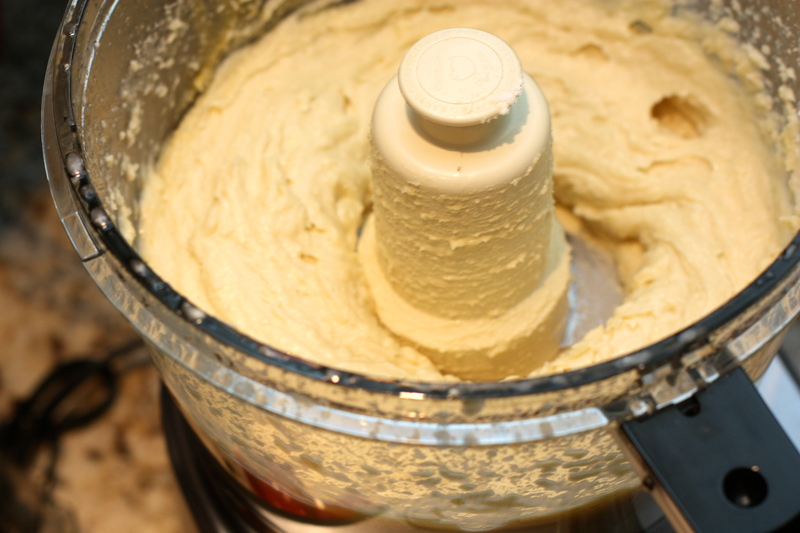 Combine all bread ingredients (except for the flour and water) in a food processor and blend until smooth. Add the flour and water and pulse until dough is combined. Dough will be a very sticky consistency. 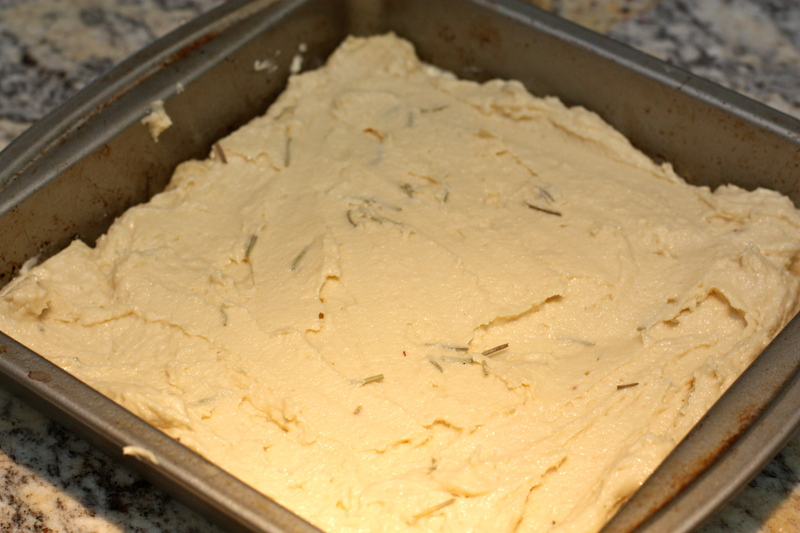 Grease a 9×9 pan and put a rectangular piece of parchment paper at the bottom. This will help the loaf come out easily. Spread a little more oil on top of the parchment piece. 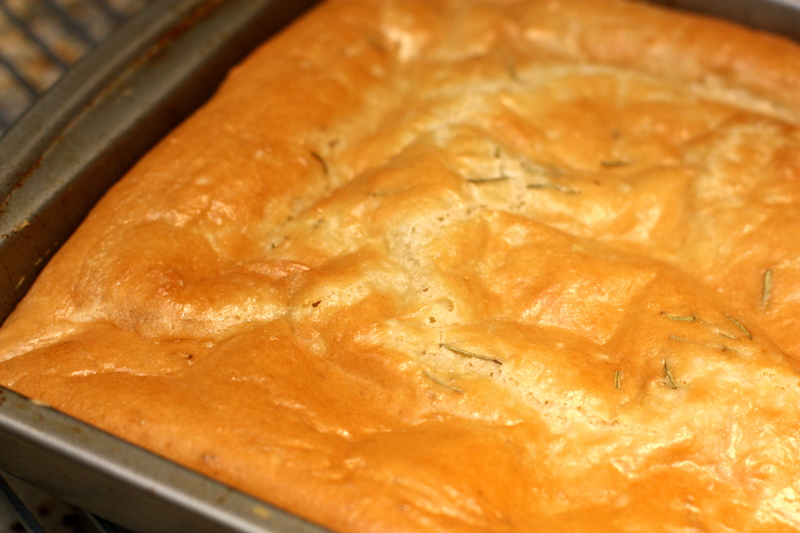 Fold the dough into pan and even it out with a spatula. Bake at 325° for about 35 minutes. Careful to not let the top burn. 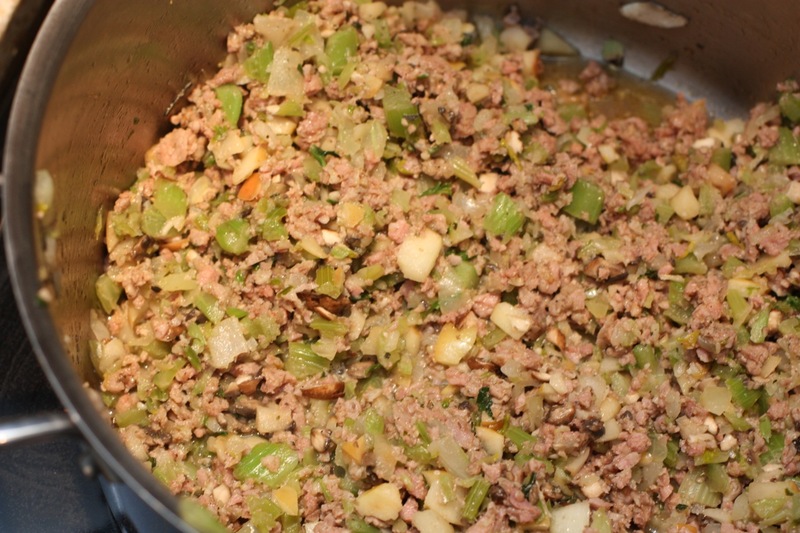 While the bread is baking, saute the celery, onions, garlic, sausage, apples, herbs and mushrooms in 1 tablespoon olive oil for about 15 minutes. Add the vermouth and bring to a boil. Remove from heat while you wait for the loaf to bake and cool. Once the bread has cooled, slice it in half lengthwise to make two thin loaves. Next, slice it into 1/2 inch strips and then across those cuts to make small cubes. Coat with 5 tbsp melted butter. Place on a cookie sheet and toast in the oven for 30 minutes on 300° turning occasionally. The bread should come out golden brown and slightly dry. 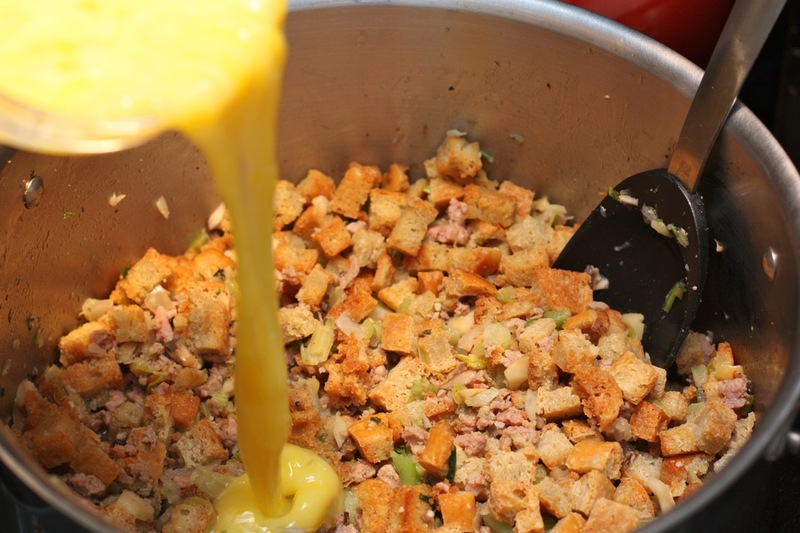 Toss the bread crumbs with the sauteed mixture, eggs, salt and pepper, and turkey stock. Transfer stuffing to a well buttered baking dish and sprinkle the additional 2 tablespoons of butter on top. Cover with foil, and bake at 350° for 35 minutes. Uncover and bake 15 minutes until top is golden. 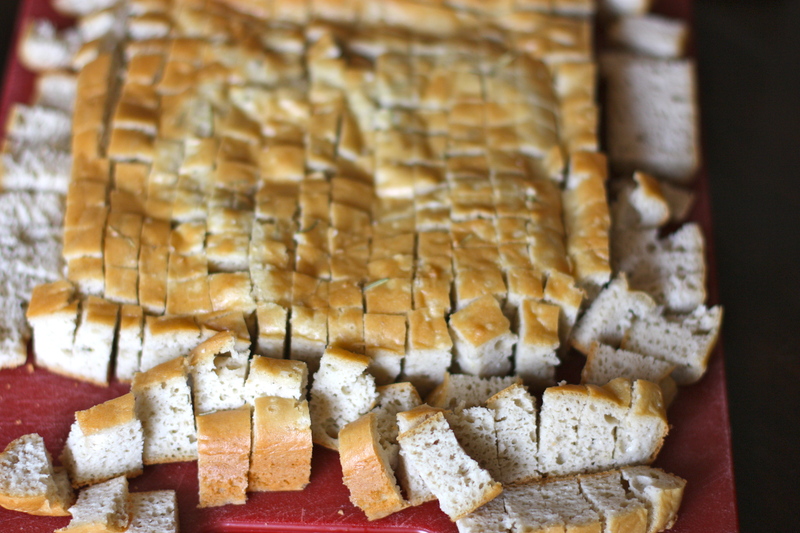 Tip : make the bread and toast it a couple of days before and store the toasted cubes in a ziplock. You can also saute the mixture the night before Thanksgiving and then put it all together right before baking.